‣ From the top menu, select File > Import > Images. ‣ In the File toolbar, click the Import Images button. ‣ In the Xsheet view, right-click anywhere in the frame area and select Import > Images. Decide if the bitmap image will go on a new layer or an existing layer. To add the bitmap image to a new layer, go to step 3. To add the bitmap image to an existing layer, go to step 4. ‣ Create Single Layer Named: Creates a layer you can name. ‣ Create Layer(s) Based on Filenames: Creates a layer based on each unique filename prefix. For example, the filenames a-1.tga, a-2.tga and b-1.tga will create layers name "a" and "b", where "a" has two drawings and "b" has one. When creating a single layer from these three filenames, all three drawings will be inserted in the new layers. 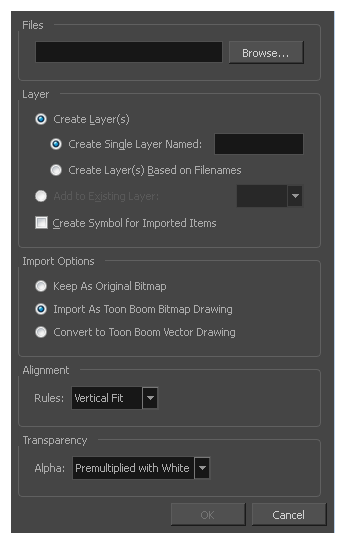 Select the Add to Existing Layer option to place the bitmap image on a layer you select from the list. If only vector layers are available in your scene, they will not be displayed in the list. You can choose to encapsulate the bitmap in a symbol by selecting the Create Symbols for Imported Items option. Enlarges or shrinks (but not distorts) the image height to match the full height of the scene grid. 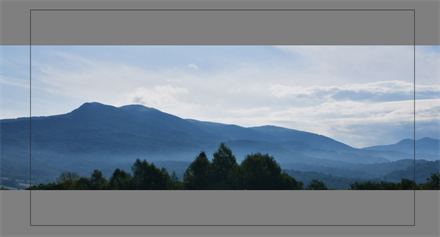 If the image orientation is landscape, this will enlarge or shrink (but not distort) the image width to match that of the scene grid. Note that the Fit alignment rule equals the Center Fit rule in the layer properties. This is the opposite of the Fit parameter. 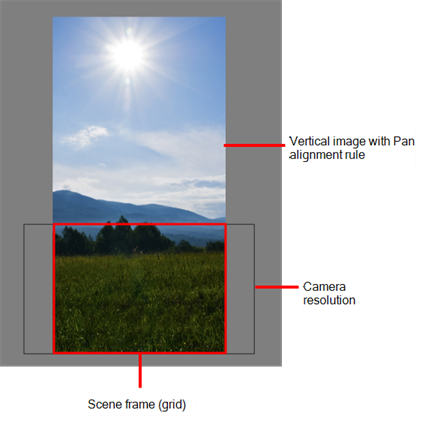 If the image orientation is portrait, its width will be made to match the width of the scene grid. As a result, part of the image’s height will extend beyond the height of the frame. This can be useful if you want to make your background move up and down, or from left to right to make it appear as if the camera is panning or to actually perform a camera pan. The opposite will apply to a landscape image. 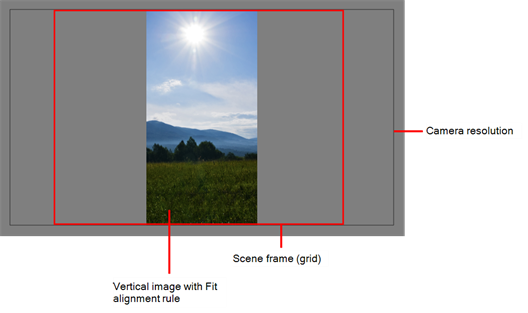 Its height will be fit to the scene grid, therefore it is possible that the image will extend beyond the scene grid's boundaries. 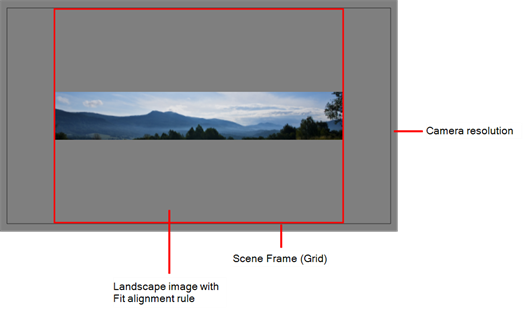 Note that the Pan alignment rule equals the Center First Page rule in the layer properties. Scales the image in proportion to the scene's resolution. The system looks at the resolution of the bitmap image, for example 4000 x 2000, then compares it to the scene's resolution, for example 1920 x 1080, and adjusts the scale factor in proportion. So, in this example, the bitmap would appear at 208% (4000/1920). If you import a bitmap that is 960 x 540, it will be displayed at 50% (960/1920) of the size of the project resolution. Note that the Project Resolution alignment rule is equal to the As Is rule in the layer properties. Semitransparent pixels in the original image are blended with black. Premultiplies the colour value with the alpha value. When the colour is clamped to the alpha, the colour value cannot be higher than the alpha value. It calculates the real colour value faster. When the RGB values are multiplied with the alpha value, that is, if you have a pixel of value R=247, G=188, B=29 and the alpha is 50% or the image has a 50% transparency, then the actual RGB values that are output would be half of the amounts listed above.